No matter if you’re searching for a slide as an addition to your existing swimming pool or as a completely new attraction, we now offer you an ideal solution. From extreme, racing, speed slides to family slides, with rafts, surfs or none … they can be open or closed, in various diameters and shapes with a small or larger capacity, where a raft can take from 2 to 6 people at once. Fun, colorful and/or themed … every single one of them represents an exciting entertainment for the whole family, the highest level of innovation, creativity and fun along with the highest level of security! Our partners are a technology leader in waterslide manufacturing. ¨Magic Shine Slide Technology ¨ is one of the latest improvements by our partner, that reflected in maximum customer satisfaction. Slides produced by L-RTM (Light – Resin Transfer Molding) technology are named as ¨Magic Shine¨. Our partners are the first European waterslide manufacturers that use RTM – Resin Transfer Molding – technology in waterslide production and single manufacturers in the World that produce World’s largest waterslide components using RTM technology. Since they started to produce waterslides with RTM technology, this became a primary choice for the park owners, operators since waterslides produced by this technology have a lot of advantages. Very briefly, advantages over contact molding methods are a uniform thickness, two finished and perfectly shiny sides and low emissions. High quality parts are being produced by this method. Pioneers in the advancement and application of the Light RTM process in waterslide manufacturing. Since 2006, they have converted to Light RTM on over 90% of their annual fiberglass production. They offer their unique Natural Light Effect (NLE) technology and Special Pattern Effects (SPE) in RTM and they offer translucent waterslides, again in RTM. The only waterslide manufacturer in the World that can offer bowl rides and family rides as RTM manufactured. Bowl rides and family rafting slides are comparibly large waterslide components and applying RTM in the production of such big scale products require higher expertise and knowledge and know-how in RTM composites manufacturing. Being able to offer ¨Translucent L-RTM Waterslides¨ is worth mentioning too since this represents the peak point of the current fiberglass composites manufacturing. Offering translucent RTM waterslides since 2007. Translucent RTM waterslide have an enriched visual impact through glossy, shiny finish on both sides, spectacular appeal and an elegant transparency. 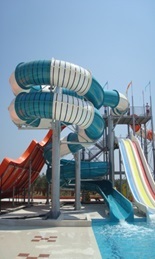 LRTM waterslide production requires huge investment and technical expertise and know-how in composite manufacturing. With 35 years of experience across the globe in the composites sector, we gained unmatched business and technological expertise. NLE system, a unique Natural Light System that only our partners offers can create natural, beautiful effects and a truly unforgettable riding experience. NLE System can be briefly summarized as the natural light effects –coming from the sun – that are created inside the tunnel type waterslides by a special manufacturing technique of fiberglass coloration. 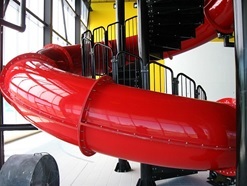 Our partners manufacture these types of slides with a very special technique that makes it possible for the natural daylights to go through the slide and create a harmonious colorful effect inside the tunnel slide when combined with the effect of flow of water. These effects created naturally take different forms depending on the status of the daylight during the day. This is really a dynamic living experience rather than a static effect. When you look at the slide from outside, you can see the colorful stripes on the outer surface. Our partner is the first and single waterslide manufacturer introducing “NLE” system to waterslide manufacturing and has been applying this technique for long years with open mould production methods. From 2009 they onwards took this one step further by now applying this method to Magic Shine waterslide as well. There are different light effect system that are being used nowadays. What is so different about the NLE system and what are its advantages? In contrast to most of the other system that are being used, no electrical equipments are being used with our NLE system. Thus, additional investments, maintenance and operation requirements are totally eliminated. Additionally, the cost and the risk of electricity usage are also eliminated. 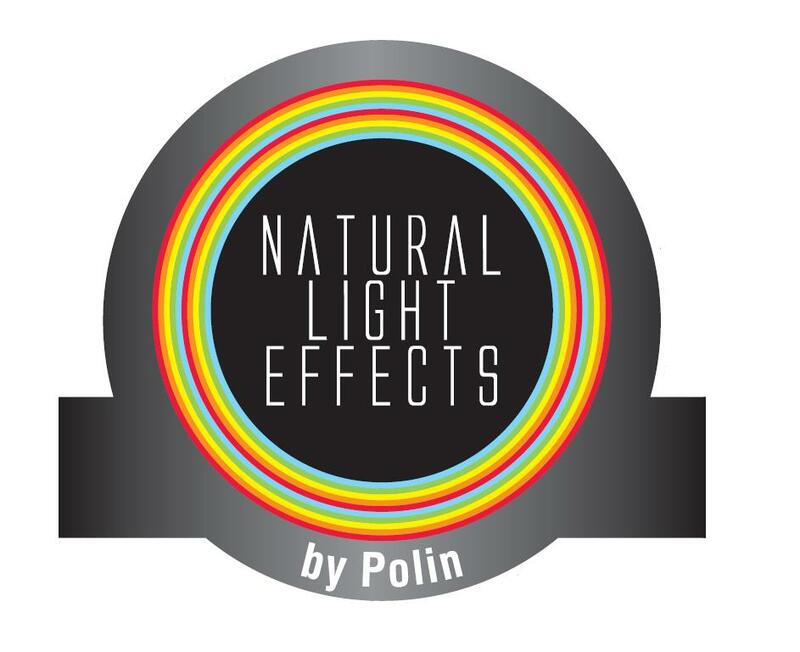 Our NLE system is as natural as the sun and its usage is totally free of charge. The other solutions that are offered through different systems like electrical power lamp, LED, phosphorous paint, etc. The lifetime of the system is limited depending on the solution chosen. On the contrary, NLE system has an infinite lifetime. As long as the waterslide is in use, NLE system will need no extra care. Since the NLE system production is undertaken in factory environment simultaneously with the production of the slide itself and NLE system production is a completely integrated process to the product itself, all the extra procedures mostly linked with subsequently inserted system like post drilling, post cutting, etc. are all eliminated. As a results, there is no risk of causing structural damage to the product that are most likely to occur with the alternative system. NLE system eliminates the guarantee problems that may occur due to the usage of different effect system. The guarantee of NLE system is included in the overall guarantee of the product itself. 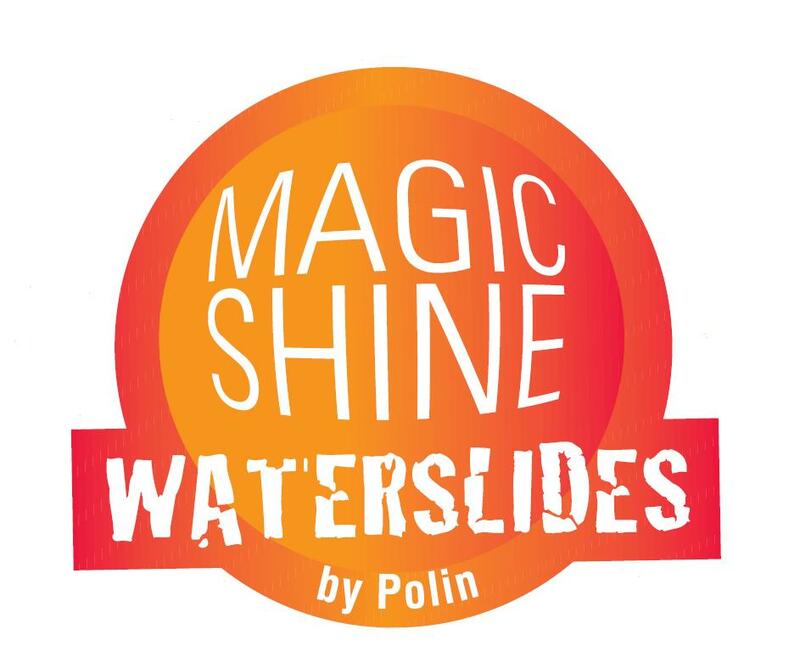 NLE system can be integrated into Magic Shine waterslide as well. 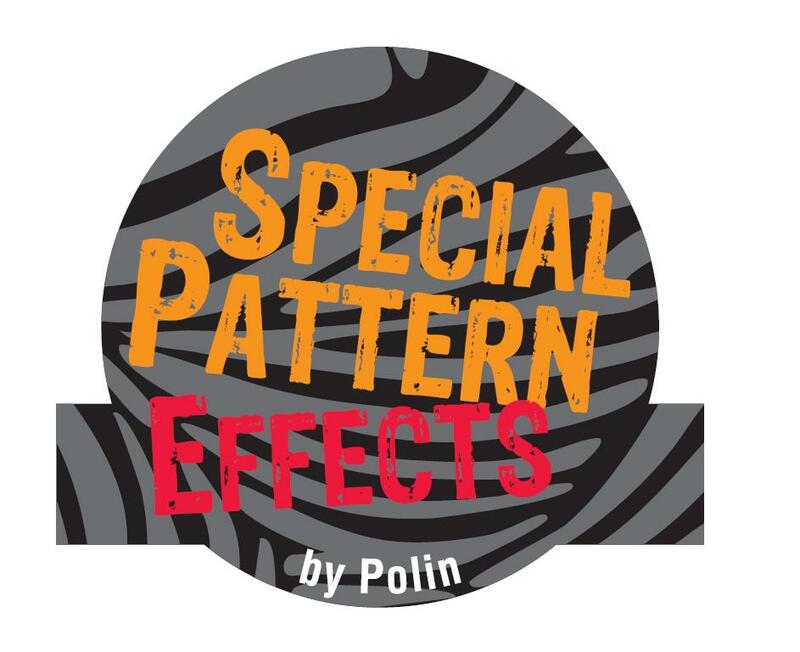 WHAT IS SPECIAL PATTERN EFFECTS? We offer you a special pattern effects by a special manufacturing technique of fiberglass coloration that requires distinctive knowledge and expertise, which is applied on the outer surface of the ride for an aesthetically superior outer look. Our partner, being the first and the single waterslide manufacturer introducing “Special Pattern Effects System – SPE” to waterslide manufacturing, has been applying this technique for long years with open mould production methods. From 2009 onwards they took this one step further by now applying this method to Magic Shine waterslide as well.